The Long Run: You CAN Go the Distance! - You CAN Go the Distance! The Long Run: You CAN Go the Distance! Who can go the distance? We’ll find out in the long run… Who is gonna make it? We’ll find out in the long run. If you want to be a marathon runner, there is no way around this one: You’ve got to put in the miles. Specifically, you’ve got to do your Long Runs! Period. Speed work will definitely make you faster. Tempo Runs will also make you faster and build endurance while helping you find your race-pace “tempo.” But the backbone workout of the marathon runner is the Long Run. You might be thinking this very same thought. Let me tell you this: you are wrong! YOU CAN DO IT! The hardest part of running a marathon is the decision to do it! Believing that you can run the distance and then actually stepping out your front door to try it is much more than 50% of the effort! I believe, more than any other sport, the marathon requires not only great physical endurance, but great mental endurance as well. If you believe you can do it, and you train your body and your brain properly, you will run a marathon! The most important thing to do on your Long Runs is slow down! That’s right, slow way down! You have been doing Yasso 800s and Tempo runs, so your body is getting used to running fast. Now you need to do just the opposite and run slowly! And that can be harder than it sounds! Your Long Runs should be run somewhere between 60 to 90 seconds per mile slower than your Race Pace (RP). If you are an intermediate or advanced runner, you can go 45 to 60 seconds slower, but never less than 45 seconds! So let me do the heavy math for you with a real example. My RP is 8:00 per mile, so I will be doing my Long Runs somewhere between a 9:00 to 9:30 per mile pace. If your RP is 10:00 per mile, your Long Runs should be between 11:00 to 11:30 per mile. I know what you are thinking: “How can I possibly run my marathon at Race Pace if I never do my long training runs at or faster than Race Pace?” Trust me. It just works! In my early days, I did not believe this theory either and I did my Long Runs much faster than I should have. In most cases, I got injured or was too sore to do the next week’s workouts and I actually lost training ground instead of gaining. So please take my advice and do your Long Runs slowly. If you are intimidated by the distance and are worried that you might not be able to complete a 20-mile run even at 90 seconds per mile slower than RP, that is OK. If you are a beginner, I do not want you to focus on time at all during your Long Runs. Focus on the distance, not the pace. What you are really trying to accomplish on these runs is to get your feet, legs and brain used to being out on the road for a long time. By running your 20-mile Long Runs around 90 seconds slower than Race Pace, you will be spending almost as much time on the road as you will come race day going the full 26.2. You should be running at a pace that is slow enough to have a conversation with a running buddy. If you can talk about work, kids, hobbies, etc, throughout the entire long run, you are doing it right. If all you can do is give simple one or two word answers to questions because you are out of breath, you are running too fast! At the end of your Long Run, you should be tired, but not totally exhausted! Save “exhausted” for race day! Another thing you absolutely must do on your Long Runs is this: Go the entire distance! Do not cut them short! This is another mistake I have made: If I am having a bad day and struggling to maintain my pace within the 60-90 second window—meaning I’m going even slower than that—I have often just given up and cut the run short. This is a big mistake. On Long Runs, distance is much more important than speed—walking the distance is better than cutting it short! I want you to go the entire distance even at the expense of time. This is especially true of the 20-mile Long Runs! If you need to walk the last 5 or more miles, I don’t care. Just go the distance! Going the distance teaches your body to exert physical effort over a long period of time, and, I think most importantly, it trains your brain to not give up! Getting your Long Runs in will make you feel great about yourself and will bolster your confidence about finishing the big 26.2. Cutting them short will leave you feeling uncertain about your progress and will cause you to question your ability to complete the marathon. Set yourself up for success. Go the entire distance! I also recommend, regardless of what your particular training program says, that you get in at least two 20-mile Long Runs. Some plans only have you do a single 20-miler and I do not think that gives you enough physical or mental long-distance training. Two or more is best, in my opinion. My YCGTD Marathon Training Plan includes four 20-mile runs. Tip 1: I am a big fan of coach Jeff Galloway’s RUN-WALK-RUN™ method for training and racing. The concept is amazingly simple: Run some, then walk some, then run some more! His research and testing with thousands of runners proves this method can help you go farther, faster. During my Long Runs, I actually walk for about 30 seconds every 2 miles. This gives me a chance to relax and drink. I chose 2-mile intervals because that is the interval of water stations in most marathons. It is actually quite practical to walk through the water stations since it is very difficult to run and drink from a cup! This method allows me to mentally break the marathon into 13 segments. Instead of thinking about running 26 miles, I only have to think about running 2 miles 13 times. For a 20-mile training run, I only have to run 2 miles 10 times! Breaking long, daunting tasks into manageable segments is a great way to ensure success! It helps me, so maybe it will help you. If you’re just starting out, this method will really help you. It is OK to walk every mile! You may even want to do it based on time. Run for 5 minutes, walk for 1. Do not be ashamed to walk. Many elite marathoners use this method! Tip 2: Set yourself up for success, not for failure! Do not do your Long Runs on a loop course. Do an out-and-back course. Why? You cannot cheat on an out-and-back. It is just as far back as it was out! You might not be as prone to temptation as I am, but I know myself. If I get really tired and there is a shorter way home, I am usually going to take short-cut! The out-and-back course also helps me mentally. There is a clear 1/2 way point and it always seems easier heading back home than it does going out. I am always highly motivated to get back home and put my feet up! Remember what I said at the beginning? The most important thing about your long run is going the full distance that your program calls for, even if you have to walk some (or a lot) of it. Do not worry about how long it takes you. You are teaching your body and your brain to go the distance and you will be glad you did come race day! Another reason I like out-and-back courses is they are easy to map out and they are reusable for all of your long run distances. If you do not have a GPS watch, use a mapping website like www.MapMyRun.com, or, easiest yet, simply get in your car and drive 10 miles watching the odometer and noting the landmarks at the miles! The same course you use for your 20-mile runs also work for 18, 16, 14, etc. Course Planning Tip: Try to plan out your Long Run course so that it has roughly the same amount of hills as your planned marathon course. It doesn’t help to have a really flat training course if you are training for a hilly marathon! So put on your headphones and listen to The Eagles as you run. 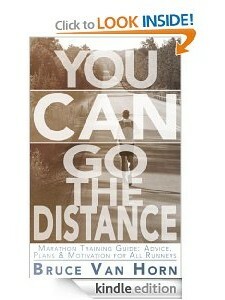 “Who can go the distance?” YOU CAN! !